*The information for this blog post can be viewed here. Information viewed here also supports this blog. 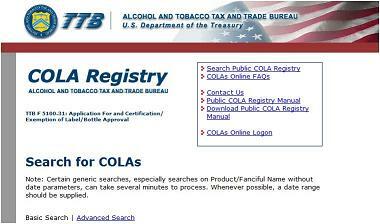 Once your label receives TTB approval, you can change certain items on your label without submitting a new COLA label. Any changes you make to your label must be in compliance with federal regulations. Move label information such as text, illustrations, graphics, etc. Change the colors, type size and font. Add, delete, or change an optional statement of alcohol content for malt beverage labels. Add, delete, or change stated bottling date, production date or freshness information. Add, delete, or change the name and/or address of the foreign producer, bottler, or shipper. Add, delete, or change a Web site address, phone number, or zip code. Add, delete, or change trademark, copyright symbols, and/or company logos. Add, delete, or change holiday and/or seasonal themed graphics, artwork and/or salutations. Add, delete, or change between approved food pairing recommendations. Delete all organic references from the label. Add, delete, or change a lot or batch identification number or other serial numbers. Add, delete, or change optional information about awards or medals. Add, delete, or change UPC barcodes and/or 2D mobile barcodes, such as QR codes. Add, delete, or change between approved responsibility statements. *please keep in mind that this list is not comprehensive. To view all allowable changes to approved labels, please visit here. If you have any questions, please do not hesitate to email me at john@beerlawcenter.com or call 919-335-5291.